In continuation of his series article on the South China Sea dispute, Manila Times columnist Rigoberto Tiglao said that former Foreign Secretary Alberto del Rosario was tricked into giving up the Panatag shoal to our neighboring country, China. Tiglao’s recent piece was based on del Rosario’s article posted at his website named Stratbase Albert del Rosario Institute for Strategic and International Studies, where he gave his explanation in response to Defense secretary Delfin Lorenzana’s claim that former administration has mismanaged the dispute with China. “During the impasse at Scarborough Shoal with China, we were approached by the US, an honest broker, for both China and the Philippines to agree to a simultaneous withdrawal of ships from the shoal. We therefore agreed. 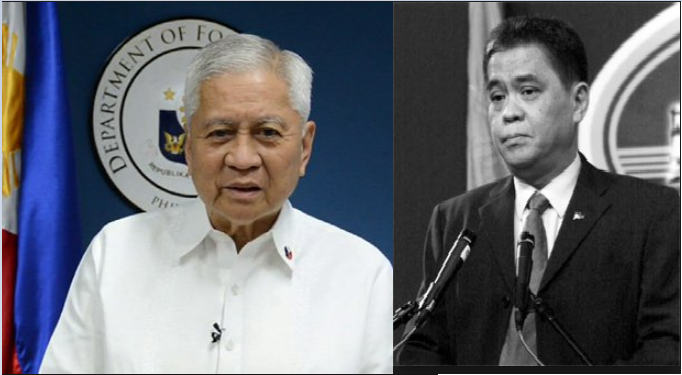 At the appointed time, we withdrew, whereas China did not – in violation of our agreement.” del Rosario wrote in his article. With this, Tiglao pointed out that del Rosario’s statement was flawed because, “Neither the US nor China has admitted that there was such an agreement; only talks for such an agreement. Indeed, if there was such an agreement, would the “honest broker” US not have raised a ruckus that China reneged on an agreement it brokered?” he said. “Del Rosario’s statement in his article is in sharp contrast to what he said on June 16, 2012, quoted in nearly all media that day two weeks after our ships left the shoal June 3: “Citing bad weather, President Aquino has ordered home two Philippine ships engaged in a standoff with China over Scarborough Shoal.” Tiglao continued. Reportedly, Sen. Antonio Trillanes 4th was then appointed by former president Benigno “Noynoy” Aquino III as back-channel envoy to handle such crisis- who also denied the agreement. “Both in an interview with Trillanes with me in 2015, and in his aide memoire “Backchannel Talks” that he gave me, the senator claimed it was del Rosario who was responsible for the boo-boo, with Aquino himself blaming his foreign secretary.” Tiglao wrote. “PNoy called me to inform me that our two BFAR (Bureau of Fisheries and Aquatic Resources) vessels already left the shoal but China reneged on the agreement of simultaneous withdrawal of their ships, so two of them [were]still inside the shoal,” Trillanes wrote in his aide memoire. “I asked him who agreed with what, since I was just hammering out the details of the sequential withdrawal because the mouth of the shoal was too narrow for a simultaneous withdrawal. The President told me that Sec. del Rosario told him about the agreement reached in Washington,” Trillanes wrote. According to a credible source per Tiglao, US indeed suggested for a simultaneous withdrawal of vessels from Panatag Shoal (also known as Bajo de Masinloc) to de-escalate the tension as it cannot intervene in the dispute. “Del Rosario immediately ordered, in the middle of the night, the BFAR and Coast Guard vessels to pull out, leaving the Chinese in complete control of the shoal. Aquino would only find out about the pull-out when he woke up – a bit late – the following morning. With our vessels leaving what we claim as our territory, we have lost it – forever, as it were.” Tiglao wrote. “Neither the US, China nor even President Aquino, nor anybody else at the foreign affairs department—except del Rosario’s protégé, then Ambassador to the US Jose Cuisia—has confirmed that there was such an agreement.” He added.